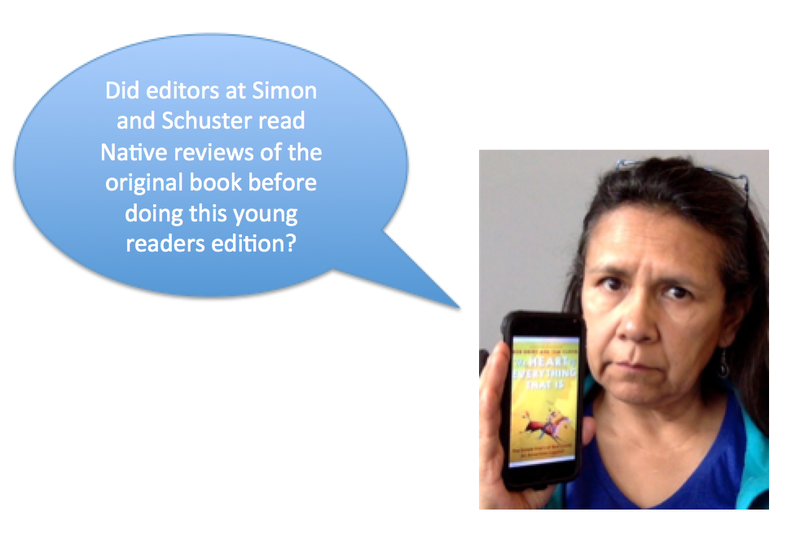 American Indians in Children's Literature (AICL): Debbie--have you seen THE HEART OF EVERYTHING THAT IS: YOUNG READERS EDITION by Bob Drury and Tom Clavin? Debbie--have you seen THE HEART OF EVERYTHING THAT IS: YOUNG READERS EDITION by Bob Drury and Tom Clavin? A reader wrote yesterday to ask if I've seen that The Heart of Everything That Is: The Untold Story of Red Cloud, An American Legend by Bob Drury and Tom Clavin is being released in February of 2017, as a Young Readers edition. The book became a best seller for Simon & Schuster. There's a critical review of it at Indian Country Today that I urge you to read. I wonder if Kate Waters (she's doing the young readers edition) or her editor at Simon and Schuster read that review? The review's title captures the problems with the book: The Heart of Everything That Isn't: the Untold Story of Anti-Indianism in Drury and Clavin's Book on Red Cloud and links to a review by Tim Tiago, too. If I get a copy, I'll be back with a review. Debbie-Have you seen the children's book Summer of Lost and Found? Story revolves around finding out what happened to the lost colony of Roanoke.